Get those triangle shaped 1/4" foam stiffeners that you cutout earlier. These fit in between the rear gear attach bulkheadand the seat back bulkhead, right above the attach fittings. Trimthem so they fit down flush with the tops of the bUlkheads. Now,put them on a flat surface, micro the bottom (underside) of thestiffener and lay-up two (2) BID at a 45° to the base of thetriangle. Let that lay-up cure. Now sand the insides of the two bulkheads about 1 inchdown from where the triangle stiffeners fit. Re-fit the stiffenersin place and bend them so they tend to stay bent. This will makethem easier to install. Sand the outer 1" of the stiffeners on theside that has been glassed. Now, bondo the 2 long edges of thestiffeners, put them in place, and hold them there until thebondo cures. Clean up any excess bondo on the inside of thestiffeners and bulkheads. Micro the slots created by the intersectionof the stiffener and bulkheads on each side (underneath)and apply 1 BID overlapping onto the bulkheads and stiffener approx. 1". At the base of the triangle stiffener, taper the foam downto the glass and leave at least 1/4" of glass exposed for a glass toglass close out. 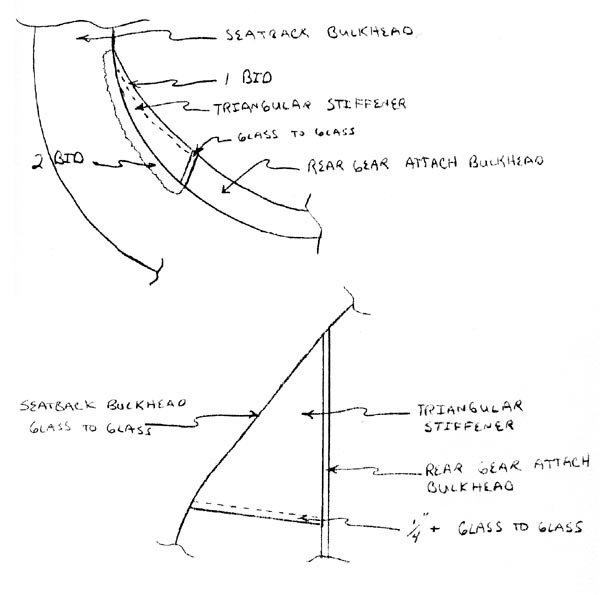 Round the top surface sides slightly so the glasswill flow across the bulkheads easily.. Micro the stiffener topsurface and lay-up 2 BID overlapping onto the outsides of thebulkheads about 1". If you are putting the belly board option on, you will needto do that at this time.